Cinnamon, commonly known as dalchini in India, is a very popular spice. The flavor it adds to a recipe can make the cuisine taste several times better. However, that’s not all it does to your recipes. It also imparts manifold health benefits too. Cinnamon has shown to be effective against certain fungal and bacterial infections including Candida albicans and Escherichia Coli. The antimicrobial properties are attributed to a compound called cinnamaldehyde in the spice. Cinnamon oil has shown to be effective in treating fungal respiratory tract infections and bacterial infections like Salmonella and Listeria. Hence, cinnamon is also beneficial in stomach upset. Being a potent antifungal agent cinnamon is also useful in curing athlete’s foot. Studies have proved that cinnamon is effective in controlling diabetes. Cinnamon is believed to activate the insulin receptors, thereby improving insulin action in patients with diabetes. It is particularly beneficial in type-2 diabetics where the problem lies in the receptors sensitivity. Cinnamon also activates several other enzymes responsible for triglycerides and total cholesterol, thereby lowering their levels. While cancers are the most dreaded group of diseases, cinnamon oil might just prove to be miraculous key. Studies have shown that it is beneficial against many tumors, melanomas and gastric cancers. One possible mechanism might be the lowering of blood glucose levels. Since, cancerous cells need their fuel from the blood lower sugar levels decrease their survival rate. Also, Cinnamadehyde and Eugenol in Cinnamon oil are effective against Human hepatoma cells and Colon cancer cells respectively. Studies have shown that Cinnamon can lower the levels of LDL and triglycerides. Although no direct mechanism has been explained, it might be the indirect result from the effect of cinnamon on sugar and fat. 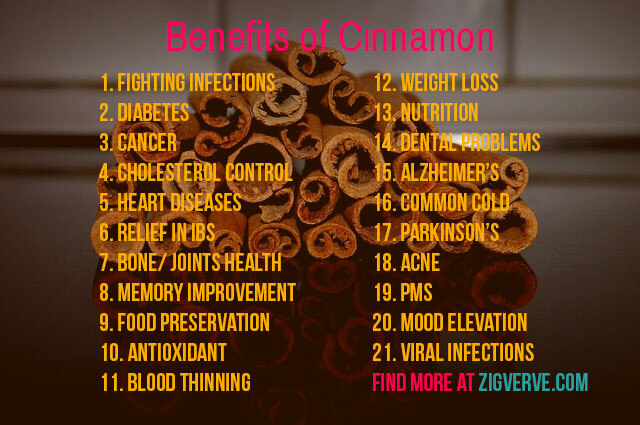 Cinnamon can be beneficial in many ways. First of all, it leads to blood thinning and thus improves circulation and reduces atherosclerosis. Also, it improves the HDL:LDL ratio, again beneficial to heart. Cinnamon also contains calcium and fibre that get rid of bile salts, forcing the body to produce more bile salts by utilizing cholesterol. Thus, indirectly cholesterol levels are lowered, again beneficial to the heart. Cinnamon has shown to be effective in relieving the bowel during IBS. The antibacterial properties in cinnamon reduce the gut bacterial load and also aids in healing infections. Moreover, cinnamon is said to have augmenting effect on gastric enzymes too. So, take Cinnamon tea for relief. It is commonly believed that Cinnamon tea can alleviate pain in people suffering from arthritis. Also, cinnamon oil massage can have a similar effect. Though the effects are yet to be proved with a proper research study. The mechanism is attributed to presence of manganese in Cinnamon. Manganese is a mineral important for bone health. Another study claims that certain aldehydes present in the cinnamon bark extract suppresses osteoclastogenesis. Osteoclasts are responsible for resorption of bone tissues; hence cinnamon decreases bone tissues resorption. A study (by Dr. Bryan Raudenbush, Director of UG research & associate professor of psychology, Wheeling Jesuit University) has shown that Cinnamon or peppermint improves alertness and lower the frustration levels while driving. Besides the study Cinnamon in general has been known to have good impact on memory, attention and intellect. Owing to its antimicrobial action and excellent flavor Cinnamon is used as a preservative in a vast number of preserved food recipes. Studies have also shown that packing paper coated in Cinnamon oil increase life of stored bread, preventing it from moulds and getting stale. Well, Cinnamon is ranked seventh when we talk about anti-oxidants. That’s a wonderful statistics. The antioxidant nature also helps in preventing cancer along with several other positive effects on health including skin. Cinnamon has blood thinning properties thus improving overall blood circulation. Hence, it acts as a mild anti-clotting agent beneficial in those suffering with heart conditions. For the same property it’s important not to consume Cinnamon while on anticoagulant therapy. The blood thinning property is attributed to the compound Coumarin. Cinnamon can aid in weight loss too by improving the blood circulation, thereby increasing metabolism. Another mechanism for weight loss is because it improves digestion and kills harmful gut bacteria. However, using cinnamon alone for weight loss is not recommended as it has negative effect on liver, and the individual might end up with substantial liver damage. Cinnamon is a good source for minerals including iron, manganese, and calcium. Thus, cinnamon is useful in deficiency of the given minerals for example in osteoporosis and anemia. Cinnamon is effective in treating many dental problems including tooth decay. The antimicrobial action fights the pathogenic bacteria and rids the oral cavity of problems. It also helps in bad breadth and gingivitis. For this reason cinnamon is a part of mouthwashes, chewing gums, toothpastes and other similar products. Several studies have shown that Cinnamon has some positive effect on Alzheimer’s. The effects of some strains of Alzheimer’s disease are delayed by the use of cinnamon. Also, there might be slight improvement in the impaired cognitive function too. The effect can be attributed to epicatechin and cinnamaldehyde present in cinnamon. Cinnamon tea is a wonderful remedy in taking care of common cold and sore throat. If you take it early at the first sign (itchy throat or snuffles) of impending cold, you might evade a severe common cold. The effect can be attributed to the anti-microbial properties along with its warming effect and improvement in blood flow that aids in fighting the infection. According to a study conducted by Priyanka Pahan and Kalipada Pahan, Cinnamon has positive effect in patients suffering from Parkinson’s. One of the mechanism is that cinnamaldehyde reduces neuroglial inflammation, thus leads to improvement. There are many other mechanisms too. Cinnamon along with honey is also used in many home remedies for acne & pimples. Cinnamon has potent antimicrobial properties that treat the infection associated with acne. Honey is used with cinnamon as it doesn’t add much to the moisture, thereby reduces the chances of the infection to flourish. The effect on PMS is attributed mainly to the manganese present in it. The manganese intake improves the mood and lowers the incidence of cramps. About two cinnamon sticks are enough for daily manganese uptake. Cinnamon is believed to help in depression by elevating mood and reducing irritability. Although it still needs to be established globally, there is an Indian study that concludes that Cinnamon can turn HIV infection into HIV controls in which AIDS is contained from developing into its full form. This effect is attributed to procyanidin polymer in cinnamon. Also, Eugenol is found effective against Herpes while cinnamaldehyde against adenovirus.